At the Quebec City conference, we chartered a comfortable bus to bring everyone on a one-hour trip that was to begin a lesson of a lifetime for most or us. We were going to spend the day with the renowned Bolduc family! We firstly visited the dedicated lumberyard where the rare and select woods for Bolduc’s famous soundboards and pinblocks are chosen. We were met by the whole Bolduc team at this site and the day began. Andre Bolduc began by welcoming us with introductions near the stacks of logs being considered for processing. These logs had already been though some “pre-screening”, having been harvested from select forests, known to produce trees that are suitable candidates for the very high standards of wood grain that must be met for the Bolduc’s manufacturing processes. Andre described how quarter-sawn lumber is very different from flat-sawn lumber. He then led the tour into the processes and machines that they developed to quarter-saw the huge logs. These machines handled the large logs easily and then manipulated/ rolled/ turned them on a cutting bed where they were to be met with a laser line and a saw blade. The speed at which this process was accomplished, given the well thought out procedures and machinery, was quite impressive. 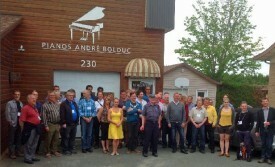 We then hopped back on the bus for a short ten-minute drive to the Bolduc Factory. This factory began as a shop which, as the company grew, assumed more and more of its own functioning and quality control; and the physical size and tooling of the facility grew dramatically. We began with a tour of the factory. 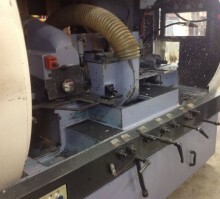 We were introduced to machines such as the half-million dollar soundboard-sanding machine, pinblock pressing machines, wood drying areas, and the shop where pianos are rebuilt. Andre showed us an experimental soundboard comprised of short pieces of wood that were excess from other soundboard construction and were assembled to form an interesting looking soundboa rd. We were asked to judge the acoustic quality of this odd-looking composite and most found it to be quite decent. This challenged us to assess the acoustic qualities of an instrument while being presented with a so undboard that did not conform to our usual expectations of what it should look like. For those that ‘judged the book by its cover’ initially, the results challenged those assumptions by producing good tones. Andre interspersed topics throughout the day to add to our understanding of the processes, while Christian took centre stage and began what each of us would regard as a daunting challenge – to remove/drill/replace a grand pinblock within an afternoon! Christian showed us many of the procedures and tooling arrangements that they have developed over the years. One of the most remarkable and handy tools in this category is their creation of the grand pinblock cutting tool which allows the technician to sever the stretcher from the pin block in a matter of minutes! This is a very powerful tool requiring both bravery and skill to handle. Christian demonstrated calm and precision in handling the tool and the efficiency with which this was accomplished proved the value in this tool within minutes. Christian then adeptly severed the doweling that held the sides of the pinblock to the rim and he proceeded to remove the pinblock. He then showed us his procedure for cutting a pinblock from the stock material that they make and supply to technicians and companies around the world. It was great to see how such an adept rebuilder chooses the tools that he is going to use and then to see him use them in a time-efficient and effective manner. Once the blank had been carved to match the old pinblock, he then proceeded to show us his set up for drilling the holes into the block. Again, because this was a real-life demonstration, he did not just show us a few examples of how this is done but, rather, he drilled every hole while we watched. The foot controlled drill press allowed him to plunge the drill bit through the block while his hands positioned the block. The bit was cooled by a Vortex Cooling system that allowed for consistency in each hole. 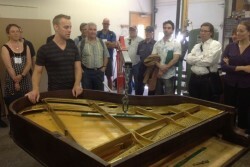 Christian then showed us his methods for fitting the pinblock into the piano and the plate. This required only a few trials of fitting/removing the block, given his approaches and methods. The plate was lowered and, with some minor adjustments, the beast had been ‘roped and tied’ in record time! It will be of interest to the reader to note that Christian did not seem to be rushing to get all of this done within the time frame that he had set out. He was able to stop and answer questions as needed, then resume his work, or just chat while he was working. Even though we had made time provisions for the work to be completed after suppertime, Christian did not need this. In all, he started about 10:30, broke for lunch at noon, and was finished removing/fitting/drilling/installing the pinblock by about 5pm! What a remarkable feat! Throughout the day, we were also accompanied by Catherine Bolduc. She is an accomplished tuner/technician who has also been asked to make technical presentations in various places throughout Asia. Catherine is also in charge of the Sales Department in the St. Joseph location, responsible for the larger Quebec area. We would be remiss if we did not also thank Michelle Lord, CEO, and Kathleen Swinford, Shipping and Receiving Manager, for their contributions in making the day go so smoothly for us and for being available to answer the many questions and inquiries. The full line of Bolduc tools were available for us to explore on this day. Their value was magnified as we saw them at play in the hands of one of the world’s most renowned rebuilders in our time. It was common to hear us speaking, at the end of Day One of our three-day conference, that the conference had already overshot our expectations in what we expected to learn/experience at this conference. Although there was still more to come in this conference that would usurp our expectations, it is testimony to the Bolducs that we left their factory feeling more-than-satisfied! 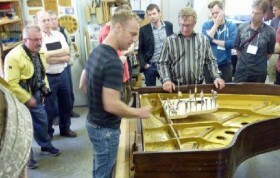 It is a rare occasion for most technicians to have the opportunity to visit a factory dedicated to piano rebuilding. What we experienced was far more that a ‘tour’: This event also provided a live demonstration, oodles of interaction time with one another and with leaders in the rebuilding world, and a personable welcome from the entire Bolduc team and family! 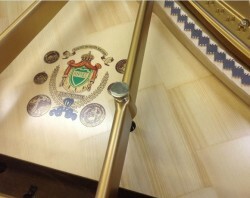 Oliver Esmonde-White’s Klavier Roller and more! ← Oliver Esmonde-White’s Klavier Roller and more!